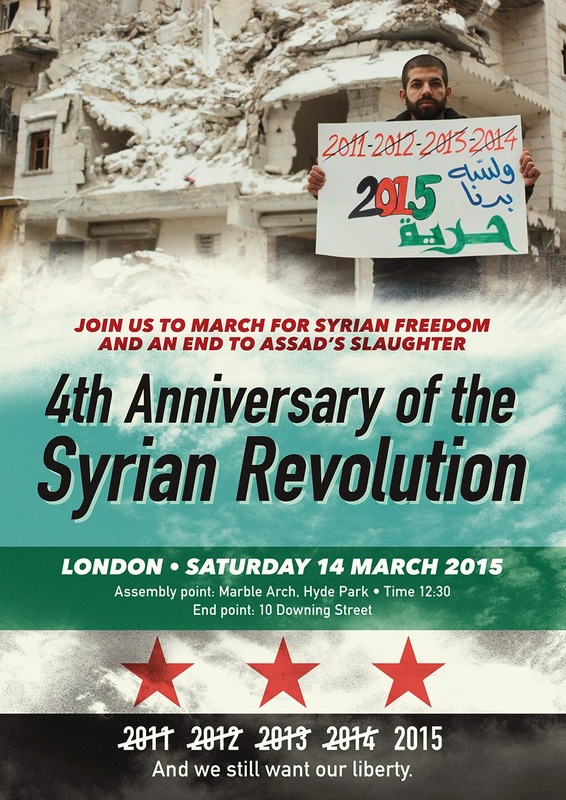 Assembly point: Marble Arch, Hyde Park, at 12:30 Saturday 14th March. End Point: 10 Downing Street. 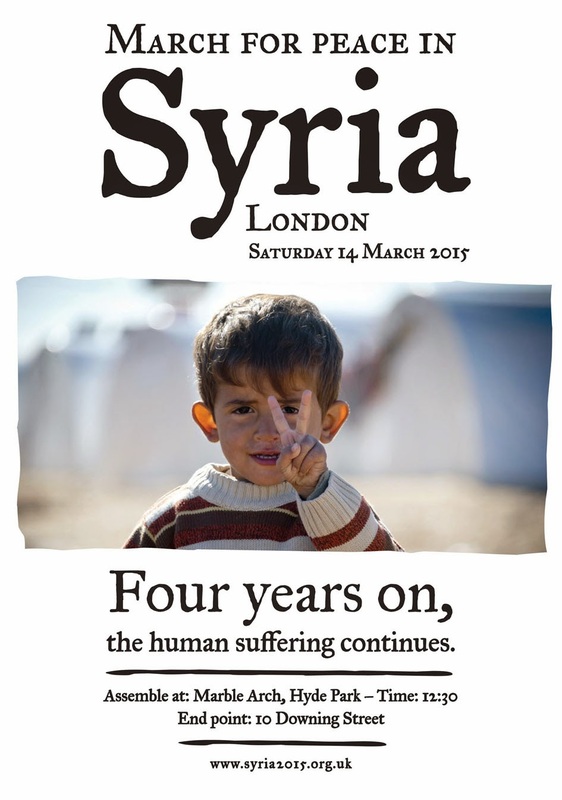 Join us on March 14th in London to show your solidarity and support for a peaceful, democratic Syria: a Syria without Assad and a Syria without ISIS. It is more important than ever to show your support. More than half of Syria’s people have been displaced. Millions have fled the country. Over 200,000 people have been killed. Over 250,000 are still in regime prisons. Syrians have been tortured, shot, bombed, starved, and gassed. Lend your voice to demand action. We cannot let the world turn its back on Syria. 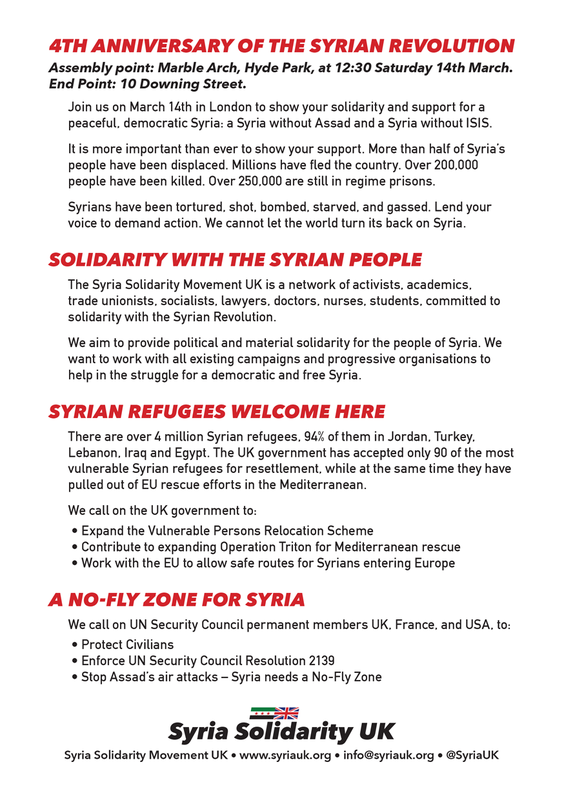 The Syria Solidarity Movement UK is a network of activists, academics, trade unionists, socialists, lawyers, doctors, nurses, students, committed to solidarity with the Syrian Revolution. 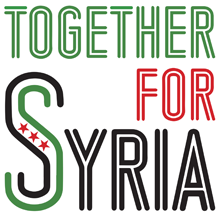 We aim to provide political and material solidarity for the people of Syria. 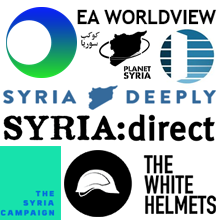 We want to work with all existing campaigns and progressive organisations to help in the struggle for a democratic and free Syria. There are over 4 million Syrian refugees, 94% of them in Jordan, Turkey, Lebanon, Iraq and Egypt. The UK government has accepted only 90 of the most vulnerable Syrian refugees for resettlement, while at the same time they have pulled out of EU rescue efforts in the Mediterranean.